Spent today walking around the Ring of Brodgar stone circle. I love the textures of the heather there. I was taking loads of photos of it and the American tourists posing with the stones must have thought I was mad, squatting in the mud and photographing twigs! 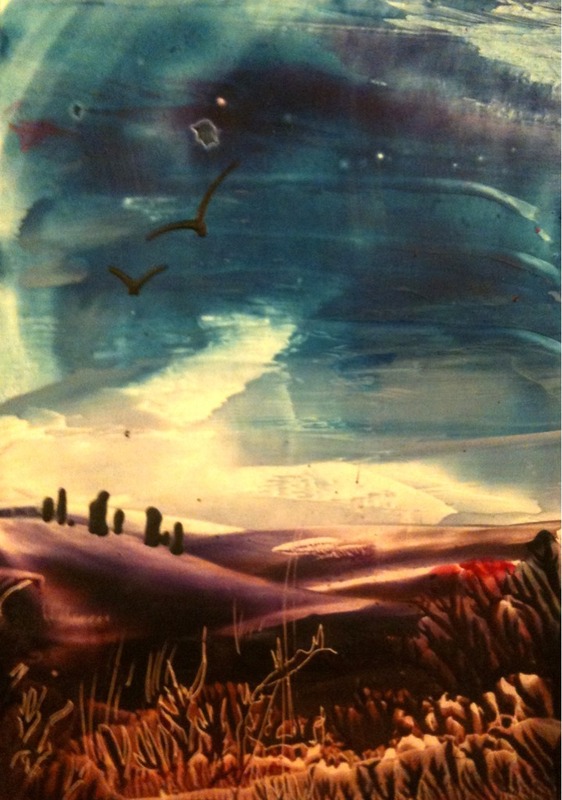 This entry was tagged encaustic, encaustic painting, Heather, landscape, Orkney, Ring of Brodgar, Scotland, Standing Stones, wax. Bookmark the permalink. Is that done with wax? Thanks 🙂 You’re primary school must have been more adventurous than mine! I like the color variation you used especially the ochre red tone with blue then splashes of pale yellow…all primary colors but so subtle but warm. Thanks 🙂 And yes I think you’re right, eccentric it is! I think eccentric only applies if you have money . . .